Forget the infamous Hatfields and McCoys – one of the most intense Appalachian feuds these days is being waged between West Virginia GOP Senate candidate Don Blankenship and Kentucky Senator Mitch McConnell. 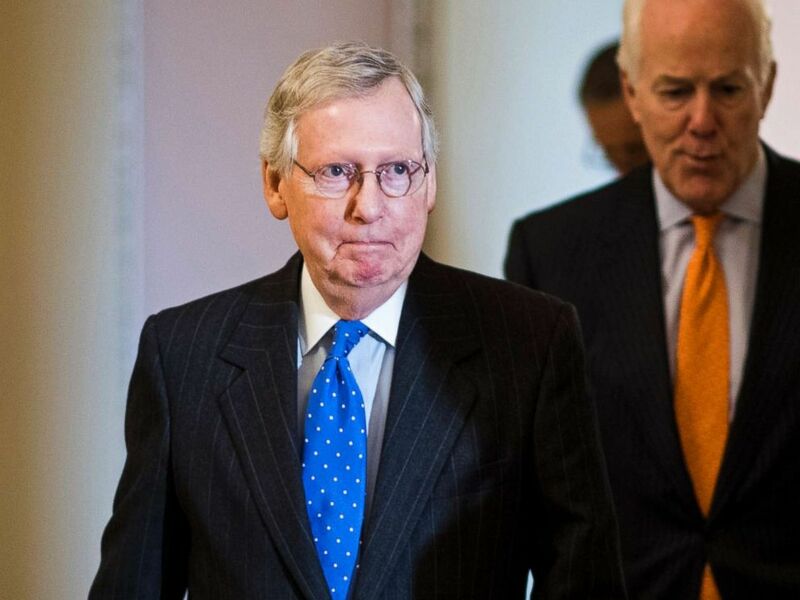 Senate Majority Leader Mitch McConnell leaves the Senate Republicans' policy lunch in the Capitol on April 24, 2018. The West Virginia Senate primary is May 8. "One of my goals as U.S. senator will be to ditch cocaine Mitch," says Blankenship with a smirk. Blankenship does not go on to say in the ad why he has nicknamed the McConnell "cocaine Mitch" but in a subsequent statement explained that the name calling was in reference to allegations a shipping company run by the father of McConnell's wife, Elaine Chao, transported drugs. Monday's ad is just the latest in a string of nicknames and accusations Blankenship has hurled at the McConnell. Most recently, Blankenship accused McConnell of having conflicts of interest because his wife's father is a "wealthy Chinaman." McConnell and his team have called Blankenship's campaign antics "ridiculous." "My father-in-law is an American, who lives in New York, works in New York. And I don't have any comment about ridiculous observations like that," McConnell told Fox News. Blankenship explained the “cocaine Mitch” ad in a statement released Tuesday. Blankenship, a former Massey Energy executive who spent a year in federal prison for conspiring to violate mine safety regulations related to the 2010 Upper Big Branch Mine explosion that killed 29, has maintained that establishment Republicans and Washington are out to get him. Trying to paint himself as a “political prisoner” and an outside candidate akin to Donald Trump, Blankenship, a millionaire, has poured millions of his own money into television and radio advertisements across the state. But outside money from super PACs like "Mountain Families PAC" with ties to Washington, D.C., have spent hundreds of thousands of dollars in advertising against Blankenship, painting him as a criminal who made money off mining families. The most recent poll from Fox News shows Blankenship in third place behind Rep. Evan Jenkins and current state Attorney General Patrick Morrissey. Tuesday night, the three face off in a nationally televised debate on Fox News at 6:30 p.m. EDT.